Heartbreaking Cards of Staggering Genius: This Is My Greatest Collecting Accomplishment: My 1971 Topps Set Is Complete! This Is My Greatest Collecting Accomplishment: My 1971 Topps Set Is Complete! Back on September 14, 2008 I posted by first blog entry about my quest to collect the 1971 Topps set. Shortly thereafter I posted my first needs list and started the long journey through trades, cards shows, eBay, comc.com, in completing my favorite vintage set. So that's over five years of patiently working a needs list. It's 5 years, 9 months, 29 days to be exact. 2128 days. In those days I completed trades for 1971 Topps cards with Mike D., Night Owl, Treasure Never Buried, Dayf, Stats on the Back, Thoughts and Sox, and probably many others that have slipped through my searches. Thank you so much for helping me complete this quest! By March of 2009 I was able to complete my first page. By July 2009, I had over half of the set. I was making great progress very quickly but as any set collector knows as you narrow that needs list to your last 200, 100, and then a dozen it gets harder and harder. I took a great leap forward with my final high number, short printed cards at the 2013 National. Since then I've been patiently searching eBay to find cheap copies of my last cards and earlier in the week I finally pulled the trigger on my last card. That last card turned out to be one of the most valuable high-number, short-printed cards #709. 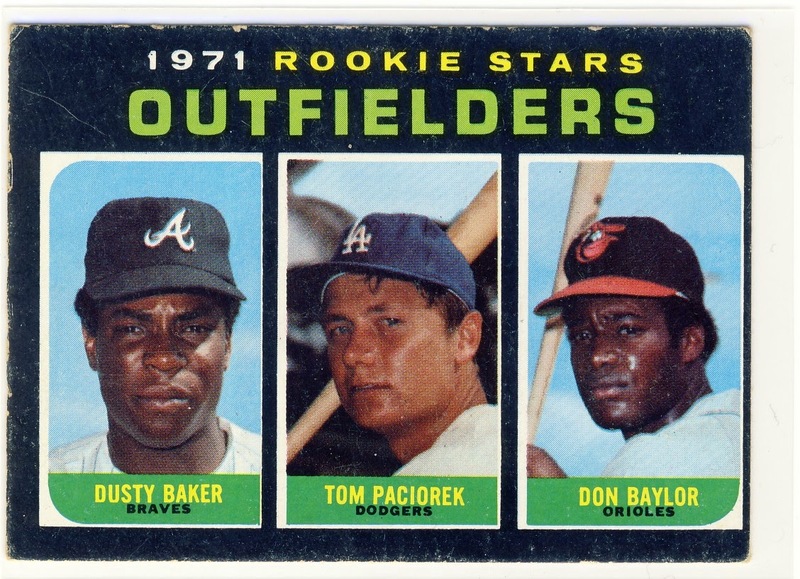 It was also the rookie card of not one, not two, but three future All-Stars Don Baylor, Dusty Baker, and Tom Paciorek. As with most of my 1971 Topps collection I haven't given too much consideration to condition of the cards. I might start trying to upgrades the rougher cards in my collection but I think I will move onto another vintage set. Please leave me some comments and suggestions on which set I should move onto next. I'm looking at sets between 1960 and 1979. Congrats, that's a great set to finish! Well done. I echo the commish's sentiments, well done! Yeah, congrats on completing 1971. I recently started trying to put together an off-condition set, so if you have any beat-up doubles to dump, let me know. The main vintage set I'm working on now is 1973 Topps. Congrats! That was one of the last cards I needed, too. In fact, I still need another one for the Dodger collection. I once did the 1972 set, mostly because I am too much of a coward to do the '71. Kudos to you. 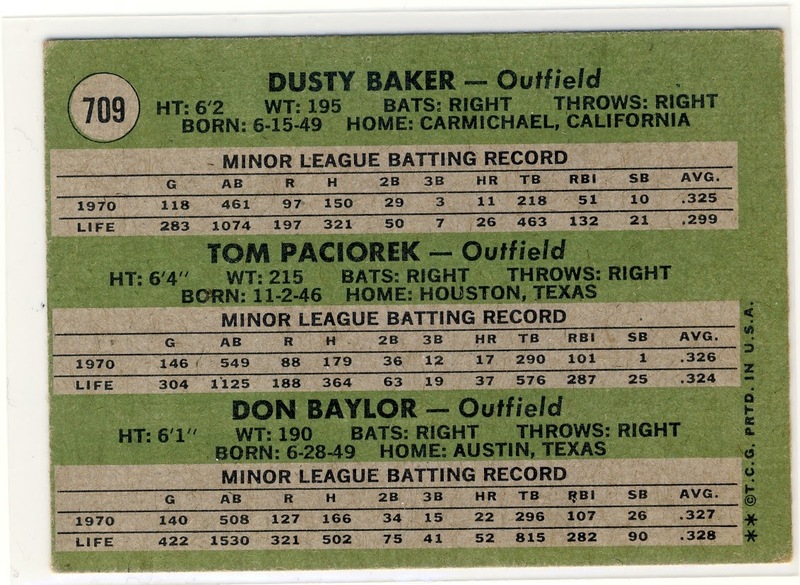 I suggest the 1969 set: lots of classic cards, great photos, no real difficult high numbers, some variations but nothing so extreme you can't do a master set (though that white letter Mantle can be trouble). I would do 73 just because off all the off the great photography. Congratulations, that is a set to be proud of. I finished mine recently as well, and found that Baker/Baylor wasn't the toughest one. Vida Blue (who I also collect seperately, was the toughest to find a decent copy of. Awesome classic set though isn't it? I second the motion on '69, or any of the later 70's, which you can probably do a couple at a time. I tend to work backwards - got 77 thru 79, then 74, 75, 76, 73 and 71, and am now working on 70 and 72. Almost done '59, and have started '60. Well done, Matt! The '71 is my birthyear set and I felt a very similar level of accomplishment when I put that last card in the binder. That was also the last card in my life-long quest for completing a Topps run back to 1970! As for what is next? I am also partial to that '69 set due to the first year appearances of the Pilots. My goal was always 70 and newer, but it wasn't too hard to chip away at the 69s while I worked on the other ones (I'm only 11 cards short now). And like GCA set, you could basically go 76-79 all at the same time pretty easily and cheaply. I can get you started on any of those! Congrats and best of luck, Matt! Glad to see all the hard work has paid off, and the trading wires and surely tireless work online has made this a memorable journey. I'm glad I was able to help you with this set, it was a tough go on those SPs but there are a lot of vintage collectors out there that like to help! I would look into a set that has a benchmark rookie in it, like maybe the 1968 set and the Ryan rookie, or the 1963 set and the Rose rookie. I also like the look of the 1964 set, but those are just talking points. The 1975 set would be a cool visual set with all the color and the two big RCs with Yount and Brett involved. You already have the Rollie Fingers card! Good luck, and well done!